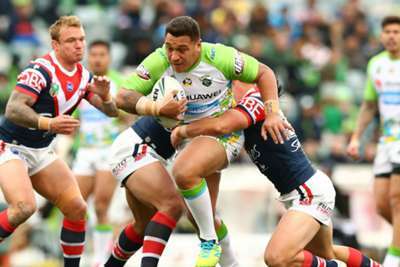 Canberra Raiders upset the form book to defeat high-flying Sydney Roosters 14-12 in a gripping NRL encounter on Sunday. The Roosters sat atop the ladder coming into this weekend's round of fixtures having won five in a row, while the Raiders found themselves out of Finals contention following a run of four consecutive losses. Sydney were widely expected to continue their fine form at GIO Stadium but, with two matches to go, the reverse leaves them level on 32 points with Melbourne Storm and South Sydney Rabbitohs, while three other sides are only one win adrift as the battle for a top-four finish and a second chance once the Finals begin looks set to go down to the wire. The Raiders edged in front through their only try of the match - Jordan Rapana surging over in the right corner. That score was converted by Sam Williams, who added three more penalties to give the hosts a 12-0 half-time lead. Sydney cancelled that out with just under 20 minutes remaining, however, as Boyd Cordner went over from James Tedesco's well-timed pass and Victor Radley held off three defenders to score next to the posts. But the Raiders remained unfazed and when Jake Friend was penalised for hands in the ruck 10 minutes from time, Williams took his personal tally into double figures and secured a surprise win. In Sunday's earlier game, New Zealand Warriors missed out on the chance to secure their Finals spot as Lachlan Lewis' late drop-goal secured a dramatic 27-26 victory for Canterbury Bulldogs. Trailing 20-12 at the break, the Warriors hauled themselves level at 26-26 thanks to a pair of David Fusitu'a tries and Peta Hiku's 76th-minute score. But there was to be no golden-point extra time as Lewis celebrated his 22nd birthday by slotting a 35-metre effort with just over 90 seconds left to secure victory for the Bulldogs and leave the Warriors in eighth, four points clear of Wests Tigers.